Farming is tough and laborious work, and in many respects, modern-day farmers face more uncertainty today about their futures than their predecessors from past generations. Significant automation has steadily eroded jobs in the agricultural sector for generations, and that trend is only accelerating. In more recent years, falling crop prices have spelled financial trouble for many over-leveraged farmers in America’s heartland, while increasingly unpredictable weather patterns brought on by climate change continue to be a dominant threat for farmers throughout the world. Amid all of this uncertainty, a growing number of farmers are embracing the opportunity to harvest a different kind of crop – the sun. Solar energy offers farmers a level of stability, profitability, and versatility that is especially attractive. The rapid innovation that has occurred in the solar sector over the past several years has led farmers to embrace numerous cost-effective applications of solar energy on their lands. Photovoltaic systems are being used by crop and livestock farmers to provide electric power for water pumping, small-scale irrigation systems, electric fencing, building lighting, livestock building ventilation, and much more. Pictured: a 60kW PV array on a turkey farm in Iowa that harnesses enough energy to power the customer’s entire farm (Picture source: CB Solar). Solar thermal systems are a similarly cost-effective method for farmers looking to use renewable energy sources to streamline their operations. Solar hot water heating systems are used by livestock farmers for pen cleaning purposes, and in particular, by dairy farmers who have substantial water heating and milk cooling demands. Pictured: A solar thermal system on a dairy farm in Carlisle, PA (Photo source: Earth Energy Innovations). The growing solar trend on America’s farmlands is a financial no-brainer for farmers otherwise accustomed to unpredictable revenue streams. Of particular note, a 2017 report by the North Carolina Sustainable Energy Association found that solar installations in North Carolina generate 30% of the income of an average farm while occupying about 20% of the land. Additionally, typical annual rent payments for farmland by solar companies range from $500 to $1,400 per acre in North Carolina, while the average 2015 rent for crop and pasture land ranged from just $27 to $102 per acre. In the small town of Kalona, Iowa – some 120 miles east of Des Moines – solar energy has bolstered a part of the Hawkeye State dominated by the technologically-averse Amish and Mennonite people. In 2014, the then-largest solar farm in Iowa debuted in Kalona when a 4.5-acre 2,900-panel solar farm was constructed by Farmer’s Electric Cooperative, Inc, a rural energy company that serves several hundred customers in southeastern Iowa. The Co-Op generates 15% of its power from solar energy, and it has the distinction of distributing more locally-produced solar energy per customer than any other utility in the country at 2.5 kW per customer. Since first being built, the Kalona solar farm has gone on to double in size, producing enough energy to power some 200 homes locally. The local farming community and broader business community have also benefited. Located adjacent to the Kalona solar farm, The Farmer’s Hen House, which processes over 1 million chicken eggs daily, powers its processing plant entirely with solar energy generated right on its door step. In North Carolina, a state that ranks 2nd nationally in its cumulative amount of solar electric capacity, major agribusiness employers, like Prestage Farms, are leading the solar energy revolution in the state’s agricultural sector. In 2012, a 7-acre 2,100 panel solar thermal farm was completed at a turkey processing plant that Prestage Farms runs in St. Paul’s, NC. At the time of completion, the solar thermal farm was the largest of its kind in the nation. The solar thermal system has allowed Prestage Farms to cut their utility costs for heating water by more than 35%. Pictured: The Prestage Farms solar thermal system produces an average of 100,000 gallons of hot water per day (Photo source: Prestage Farms). Some policy makers claim that the proliferation of solar projects on American farmland “hurts” the land by limiting its use. While these concerns are reasonable, they clash with reality. Many solar farms serve dual land purposes, allowing for animals like sheep to be reared on lands occupied by solar panels. The sheep help maintain the property, reducing maintenance costs for the landowner, while the sheep owner gets a dirt cheap living arrangement for his livestock. Whole companies, like NC-based Sun-Raised Farms, have even been created to facilitate this marriage between solar farming and traditional livestock farming. 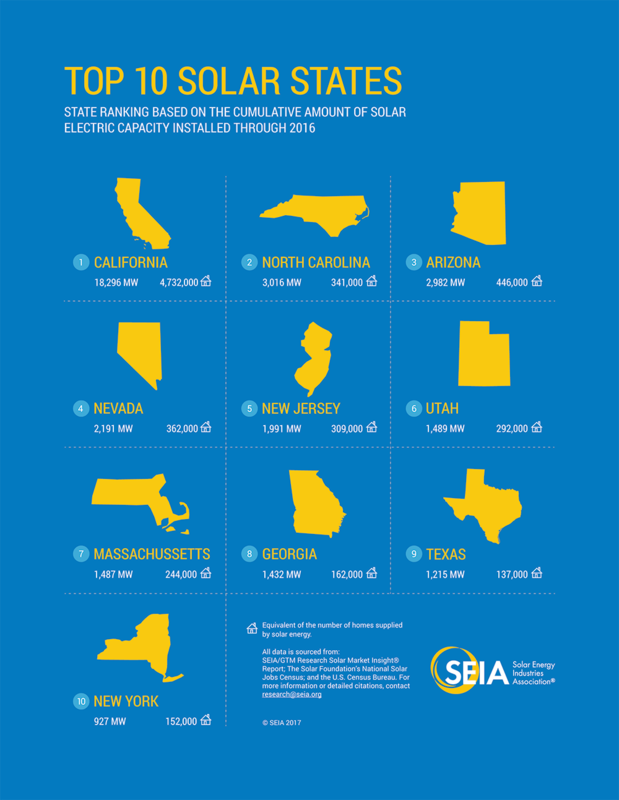 Additionally, in North Carolina, where ag-related solar projects have spread like wildfire, just 9,000 acres of cropland has been re-purposed for utility-scale solar projects over the past decade. By contrast, over 1 million acres of cropland has been lost to commercial and residential development over the same time period. Clearly, solar projects are not what is threatening America’s farmlands. Solar energy opportunities represent a life preserver for many an American farmer struggling to adapt in an era of uncertainty. Farmers looking to diversify their revenue streams recognize the tremendous opportunity that solar leasing affords their business, without significantly limiting their overall farming capabilities. Solar energy is helping to put more money back into the pockets of farmers in rural America, while allowing them to reduce their carbon footprint and make our food systems more sustainable – a win-win for everyone.